A vaporizer allows you to enjoy your herbs without the disadvantages of traditional smoking. Rather than combusting your dried herb, a vaporizer heats it to the point where the cannabinoid crystals evaporate. It doesn’t produce smoke and doesn’t require tobacco, which leads to a more pure and clear high. Another advantage of vaping is that it uses less weed, which means it helps save you money. There are many types of vaporizers available that range from affordable and portable to very advanced desktop vaporizers. This is it! THE spot to find the best vaporizers on the market today. Zativo has portable and desktop vaporizers up for grabs. Determine the preferred setting - on the go or outside the bar vs. a vape party with friends for example - and choose the type that suits you best. Don't forget to visit the Extras and Accessories page to find cool stuff to enhance your vaporizer or replace a worn out part. A revolution has emerged. Cannabis enthusiasts are embracing vaporizers or "vapes" as the new-school method of consuming their precious herb. Vaporizing refers to releasing compounds using heat, without combusting the heated substance. Besides the fact that today's vaporizers look cool and futuristic, they hold many benefits over smoking regular joints. There are plenty of vaporizers out there, ready to be involved in solid ganja endeavors. Before beginning with today’s vapes, let’s start with the intriguing history of vaporizing. Did vaporizing techniques arise in the last century? - Nope. Vaporizing various herbs was practiced for millennia. Approximately 2,500 years ago, Herodotus mentioned that vaporizing techniques were used by the Scythians to release vapor from hemp seeds. Around 1500 years ago, the Hookah (water pipe) practice came to light. The heated material was placed near the herbs, resulting in delightful vapor rising from the herbs. We use Hookahs to this day. Let's fast forward to 1928, when Joseph Robinson patented the first known, electronic cigarette. The patent description states that Joseph's invention ought to “be freely handled without any possibility of being burned, and which is sanitary and very` effective and so simple "that anyone can use it”. It's also mentioned that the invention is made for “holding medicinal compounds”, not necessarily tobacco. Herbert A. Gilbert is considered the pioneer of the modern day e-cigarette, which he designed in the 60's. During an interview, he mentioned that "when you burned leaves and wood, even if you did it in your back yard, it yielded a result that no one wanted to take into their lungs". This inspired Herbert to create the E-cigarette. In the 90’s, vaporizing got reconnected with cannabis, by Eagle Bill, father of the cannabis vaporizer. For several years, his exhibit, reminiscent of today's Volcano vape, was presented in Sensi Seeds' “Hash Museum” in Amsterdam. During the 1994 Cannabis Cup, Bill showed off his vaporizer, which blew away an abundance of minds. Ganja enthusiasts were amazed by this revolutionizing device. "Shut up and take my money! ", perfectly describes their reaction. Bill made a name for himself and won many prizes for Sensi Seeds and himself. He decided to invent a cheap version of the vaporizer coined as “Eagle Bill - Shake and Vape”. It's basically a pipe, which is heated from the bottom without combusting the herb. Spliff toking will not perish anytime soon. Although, vapes seem to be conquering the hearts of devoted smokers, due to the numerous benefits. Vaporizing cannabis prevents the creation of toxins that are associated with smoking. Basically, cannabis contains hundreds of chemical substances. Each substance is released at a specific temperature. For example, CBD is released at 160-180°C, while THC at 158°C. Desired cannabinoids, terpenoids, and flavonoids are released between 170-200°C. A burning joint, significantly surpasses these temperatures destroying many of the compounds, resulting in tar and other toxins. Of course, scientists are still trying to recognize the benefits of all cannabis components, at which temperatures they are released, and how to extract them. It's important to note that certain cannabinoids change structure when heated. For example, CBDA is CBD with a carboxylic acid attached to it, when CBDA is heated at about 80°C, the carboxylic acid is released, leaving the CBD behind. Studies suggest that CBD and CBDA can induce different benefits. Therefore, scientists are trying to figure out the ultimate vaporizing use for cannabis, and how cannabinoids and other components function in general. When cannabis is smoked with tobacco, it makes everything worse. When burned, the mix releases toxins from tobacco, which have adverse effects on one's health. As a result, many anti-cannabis advocates present studies which show how harmful cannabis is, without taking into consideration that it was combusted, and in most cases, combusted together with tobacco! Therefore vaporizing will not only change our "highs", but bring forward statistics which can be used for pro-cannabis advocacy. Now that we’ve covered the general facts about vaporizing, let’s distinguish between different vaporizers present on today's market. There are hundreds of different vape designs and functionalities, which can be hard to understand. Everyone has their specific preferences as to their vaping experience. To make it simple, we'll clarify what's going on. Vaporizers can be portable or stationary. Portable vapes are obviously made for carrying around. Usually, they comprise smooth designs, which makes them perfect for outdoor use. Going to the park? A portable vape is the way to go. On the other hand, desktop vaporizers such as vape-bongs and the Volcano, are designed for home use. Volcano is great when many people are involved, because the vapor-filled bag can be easily passed around. Vape-bongs are suitable for personal use, because they're not easily passed around. Vaporizers comprise different types of batteries, which are imperative to vaporizing the ganja. Vape batteries fall into two main categories, replaceable and non-replaceable. Vapes with replaceable batteries allow the user to change the batteries, or to charge or remove them. The Pax vaporizer is the perfect example of a vaporizer with a non-replaceable battery; a non-replaceable battery is built into the unit. It makes them virtually impossible to remove, unless the entire structure is opened, which is definitely not recommended. Vapes can be charged by USB, DC, or simply by replacing the batteries - depending on the model. This is generally true for portable vapes. Desktop vapes are usually powered by DC, although they can have battery systems in place. Vaporizers should be cleaned and maintained. Some vapes are easier to clean than others. Vapes which make it hard to open certain compartments can make the cleaning experience strenuous, while some vapes are specially designed for easy maintenance. This is definitely something one should consider before purchase. Vaporizers differ in temperature settings. Most of them have the perfect temps for vaping cannabis in concentrate or dry form. Some vapes allow the users to select precise temperatures; these vapes are usually on the more expensive side. It’s rare to encounter a vape that only has one temperature setting and can’t be changed. Usually, vapes have several pre-set temperature settings, which the user can play with. Having good temperature control is necessary if one wants to experiment with distinct "highs", which result from specific cannabinoids and other compound being released at different temperatures. Conduction vaporizers comprise of a heated plate which is in direct contact with the inserted herb or concentrate. Magic Flight Launch Box is a perfect example of a conductive vaporizer. If not controlled properly, this can lead to combustion and smoke - which is to be avoided. Fortunately, use of conduction vapes is usually easy to pick up. Convection vaporizers are heated in a different manner. These vapes heat up the air inside of the device, which is transported through the herb compartment. This enables an even spread of heat and controlled temperatures. Combustion is almost impossible, which is perfect for vaping cannabis. These vapes take a longer time to heat up, although the Grasshopper vaporizer is an exception. 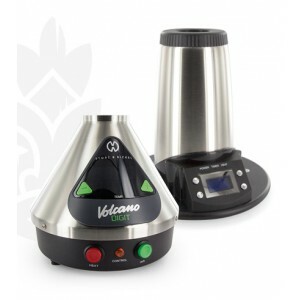 Two types of vaporizers are present on the market, manually heated and electric. Manually heated vaporizers, such as the Eagle Bill and Vapo2, need to be heated with a lighter or torch. The flame doesn't touch the herb or concentrate, it simply heats up the glass or other material, which in turn vaporizes the ganja, without combustion. On the other hand, electric vaporizers are heated by battery or DC power. One simply turns on the vape, and the vaporization takes place. Let's check out the pros and cons. Pros: You don't need to charge the vaporizer or connect it to a power source. You simply need to have a functioning lighter, and you're good to go! On top of that, they are quite cheap, and therefore easy on your wallet. Cons: There is no temperature control. If one wishes to vape at specific temps, due to aforementioned factors, manually heated vapes will not deliver. They also take relatively long to heat up. The heated material becomes very hot, so one needs to be careful with the vape after heating. Pros: These vapes are favoured because of the temperature control and the speed of vapour creation. Also, they are relatively safe, because the heating occurs inside of the vape, not outside. Cons: They need to be charged, or one needs to have spare batteries. Many stationary vapes have to be plugged into a power source. Another difference in vaporizers is whether they're automatic or manual. Automatic vaporizers mimic the functionality of a regular cigarette. When an automatic vaporizer senses suction, the battery heats the chamber, which creates vapor. Manual vaporizers, on the other hand, need to be primed before inhaling. A button needs to be pressed to activate the battery, which in turn heats the chamber. Once the chamber is heated, one can take a drag. Let's explore the pros and cons of automatic and manual vapes. Pros: Automatic vaporizers mimic the regular joint smoking experience. One simply takes a puff, which activates the battery, which generates vapor. When the vaporizer doesn't sense suction, the chamber is not heated. One doesn’t need to push a button every time to smoke. Cons: In some cases, liquids could leak into the battery because of an automatic vapes' design, although this is quite uncommon. Also, to get the vaporizing going, one needs to take a few tokes before any vapor comes out. Sometimes, automatic vapes can activate because of loud music, or other stimuli, which is highly undesirable. Pros: Manual vaporizers can be primed by simply pushing the button. The material vaporizes once the button is pushed. This allows the vape-head to instantly get a solid vape hit, instead of sucking on the vape a couple of times before anything comes out. Manual vapes don’t have the danger of liquid spills, the batteries are totally separated from the material. Also, vibrations and other stimuli won’t activate the vape. Cons: The button could be pushed in a cramped space, like a pocket or anywhere. This can damage the battery and waste the packaged material. Also, one need to push a button every time before smoking, which can be a hassle for some people. One needs to consider that there are many different vaporizers out there. For example, some high-quality automatic vapes don’t need extra inhaling before the vapor comes out, are quite secure against oil spills, and comprise secure activation systems. Manual vapes can also have a special system where the button needs to be pushed three times in a row to be turned on, which greatly reduces random activation. Quality and design of the vape are very important to ensure a smooth toking experience. For example, some vapes need to be dragged slowly, as not to combust the dry herb. Some manual vapes need to be primed for a long time before toking, etc. DIFFERENT VAPES FOR DRIED HERB, CONCENTRATES, AND RESINS? Not all vaporizers are suitable for all forms of cannabis. There are different vaporizers on the market with different functionalities. Cannabis can be consumed in different formats, such as dry herb, hash, kief, BHO, shatter, wax, butter (budder), and oils. Different concentrates such as wax and shatter, combust at higher temperatures than dry herb and kief. So the temperature settings should be different for dry herb and concentrates. The main difference to consider is the chamber structure. Many pen vaporizers comprise a heating coil which directly heats the packed substance with heat. These pens work for concentrates, although dry herb will easily combust. Therefore, some vape companies offer changeable attachments for material, which can be replaced in order to overcome this obstacle. The attachment for dry herb has a special design, which separates the dry herb from direct contact with the coil. Also, cannabis oils can have a different attachment which looks like a classic E-liquid oil chamber. Some vapes will only take dry herb, while others are designed for concentrates. Some can do both. Be sure to get one to suit your needs. Buying a different vape for all cannabis forms can be a hassle. Therefore, many vaporizer companies will say that their products are 3-in-1, meaning that the vapes can vaporize oils or resins, concentrates and dry herbs. It's important to research whether a vaporizer has all the necessary attachments for the desired material. Think about every way that we smoke cannabis - from a hookah to bong. All these methods can be potentially replaced with vapes with the help of accessories. One can purchase a special vaporizer-to-waterpipe converter, which vaporizes the weed at desired temperatures and then inhaled through a waterpipe-like setup. 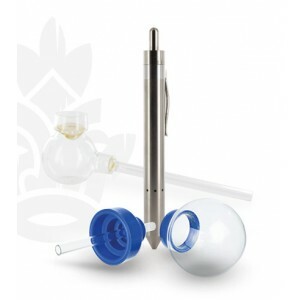 Some vaporizer pens can be attached to a bong, creating a vaporizer bong. There's even a device called "UFO" which can turn any drinking glass into a vaporizer bong, which is then attached to the Magic Flight Launch Box. The possibilities are vast. Only time will tell, what the future holds for vaporizers. Although, we are certain that vaporizing methods will become more prevalent in the future, due to their benefits over smoking. The taste is delicious, the smell is fresh, and the overall high experience is excellent.